Recent reports and media coverage have reinforced the message and danger around Logical Attacks on ATMs. These attacks are increasing in frequency and sophistication. Further, the attacks are now seen in every region. Join this informational webinar where NCR experts will provide more details on these attacks and provide you with the strategies for reducing your risks. Moving to a new card and payment processing system is always a high risk project. A key way of reducing the risk is carefully planning a phased migration process such that everything does not change at once. On this webinar, experts will define a standard migration approach, based on the experience of migrating customers both large and small, but there are circumstances where it is right to change the approach. You'll hear and see real-life case studies to demonstrate the standard migration approach and alternatives that also have been successful. By 2020, 30 billion wireless devices will account for more than 60% of web traffic. Much of this will be in restaurants, stores and other public spaces - which means more opportunities for hackers to get into your network and steal your customers' data. So many SMBs lack the technical experience or their own IT security department to manage their Wi-Fi infrastructure, and that can put your infrastructure--including information about your customers--at risk of being exposed to cybercrimes. Join NCR's Dustin McCreight to explore the benefits of building a robust security strategy for your Wi-Fi network and how protection at the network layer can help keep your data safe. Cyberattacks against small and medium size businesses are successful 83% of the time. Often, SMBs have less sophisticated IT departments to manage and update their security solutions and, despite their best efforts, they can become victims of a costly breach. With remediation costs for breaches averaging over $3.5 million, are you confident that your solution is sufficient enough to protect your business from becoming a target of the latest cyber threats? •Deliver greater flexibility to introduce new services from core banking or adjacent server systems like Interactive Banker, CxMarketing, and On-US transactions. •Replace the states and screens download from the Host (Switch) and remove States and Screens management costs while allowing the flow and interactions to be controlled by the enterprise server instead. •Use agile technology and practices to introduce innovative new business services for use with existing Switch based transactions. •Deliver highly personalized messaging to target key locations, e.g. on- or off-us customers, key sites and specific events. Whether you’re upgrading your current ATM operating systems or seizing the opportunity to replace your ageing ATM estate with the latest in self-service hardware, this webinar will take you through the pros and cons of upgrading or replacing and how NCR can help you implement your RBI action plan. Don’t miss this opportunity to attend an informative webinar to learn more about how ransomware attacks are affecting the Retail and Hospitality industries and more importantly, some preventive strategies to help improve security in your environment to keep your business secure. Learn how advances in ATM hardware design and improvements in the processing and software stack can make your ATM network more secure from the very start. Learn about recent ATM Card related attacks and the latest defense strategies and capabilities you can implement to make your ATM network and customers more secure. A review of the latest ATM PCI - PTS related compliance changes, requirements and solutions. Connecting the channels is the key to SUCCESS ! Charlie Harrow will guide you through how 'Black Box' attacks against ATMs are carried out and how you can defend your network against such attacks. 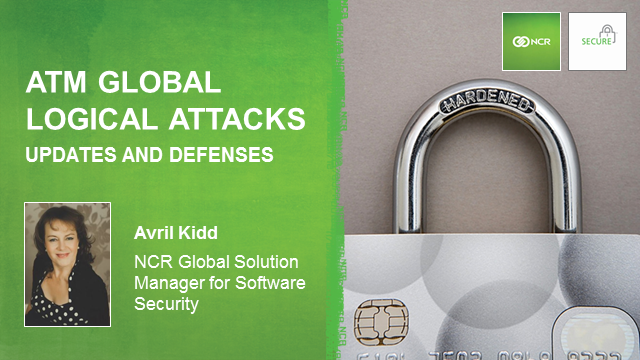 Avril Kidd will explain ways to protect your ATM Network from attacks. Owen Wild of NCR will explain how online ATM malware attacks are carried out and ways to mitigate these attack types. The PCI Security Standards Council has established a suite of standards for a broad response to threats that comes in the form of PCI DSS. All Payments processors, including ATM deployers, must demonstrate PCI DSS compliance. Financial institutions should have migrated to the latest Transport Layer Security, TLS 1.2 protocol to move away from SSL and early TLS and reduce the risk of a Payments attack. Join us May 31st where NCR’s Payments and Risk experts will discuss the background of PCI DSS and the TLS1.2 protocol and how NCR solutions can help banks drive their business and be ready for June 30th! Open Banking and APIs are becoming increasingly important in the banking world. Legislation (such as PSD2), the growth of Fintech organizations, and consumer expectations are driving forward new ways of accessing banking and making payments. These changes are paving the way for third party providers to build applications and services that deliver a ‘complete experience’ for a specific service for consumers and corporates. However, this is a challenge for financial institutions who for decades have focused on maintaining ‘closed’ payment systems that protect their account holders’ data – and their own – at all costs. The basic principle that value can be created by sharing key data assets is a big challenge for financial institutions especially in getting the IT structures in place to allow this to happen. -How do we get there? -Understand the context: Why here, Why now? -What will Open Banking look like? This webinar explains why financial institutions (FIs) and other ATM deployers need to start preparing now to upgrade their ATMs and other self-service terminals to Windows 10. On January 14, 2020, Microsoft will stop supporting Windows 7. This means that Microsoft will no longer provider security updates, application patches or technical support for ATM deployers running Windows 7. As a result, Windows 7-based ATMs are at high risk of not being PCI DSS (Payment Card Industry Data Security Standard) compliant. PCI DSS requires ATMs to be updated with vendor-supplied security patches to protect systems from known vulnerabilities. Listen to NCR, Microsoft and Customer speakers.